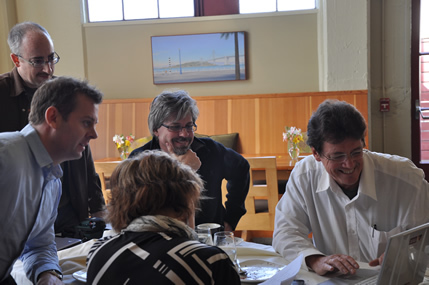 SOCAP and Dr. Willie Smits | Collaborate for Change! For people who have made their fortune, and want to give back to the planet, SOCAP provides the perfect forum. Philanthropists from across the globe convene with social entrepreneurs who are looking for investment in sustainable, typically environmental projects. This year, Virgo pitched the DeforestAction Project in conjunction with the 3D Action Movie, at a session called “The Big Pitch!”. The major goal of this pitch was to secure funding for the movie. The secondary goal, was to create awareness of the project. 1. Dr. Willie Smits. I don’t even know where to start with how to explain Willie. It’s like someone crammed five fully functioning brains into one mans head, then turned them up to 100% efficiency. His ideas, energy and knowledege on how to save rainforests, protect (and communicate) with orangutans, and connect the project to some of the biggest names on the planet were unparalleled. I ran a quick BING search on Willie – his credentials are better than the President’s http://en.wikipedia.org/wiki/Willie_Smits_ . When Willie announced he wants to be part of this project, and shared his ideas – including building a 75 m high technology tree for orangutans to be rehabilitated in – any remaining doubts I had about the future of this project disolved completely. 2. Richard Zimmerman. One of the most passionate and intelligent people I’ve ever met, Richard runs Orangutan Outreach. If orangutans had a church, he’d be up on the wall at least as a cardinal – probably pope. Richard has dedicated his life to saving these ‘people of the jungle’, and his selflessness on pursuing this cause is humbling. 3. Mark White. Mark is founder of White Crow Productions. He strikes me as the quiet achiever; hugely knowledable and passionate about the environment. And – he’s working on the movie crew with Cathy and her team. He’s also passionate about supporting young people. When Richard, Willie, Mark, Cathy, Tara and the rest of the team become accessible to the young people of the planet, to support them in achieving their goal of saving the forest, this is going to completely transform how we think about education and how young people think about their voice on the planet.